Geghard, a unique architectural construction in the Kotayk province, is one of the most interesting tourist attractions in Armenia that you ought to see. The exact date of foundation of the monastery is unknown. However, we know that the place for the monastery is not accidental, since pre-Christian times Armenians revered places with natural spring water; spring water is located just inside the main narthex. It is believed that at the beginning of 4th century, the first years of adoption of Christianity as a state religion in Armenia, monastery called Ayrivank (“Monastery of the Caves”, now Gegard) was built. The facts about monastery and its development attributed to the first Armenian Catholicos St. Gregory the Illuminator and St. Catholicos. Sahal Partev. From the beginning of founding the monastery the monks lived in the monastery and in the neighboring caves. It is believed that St. Gregory the Illuminator lived in one of these caves. 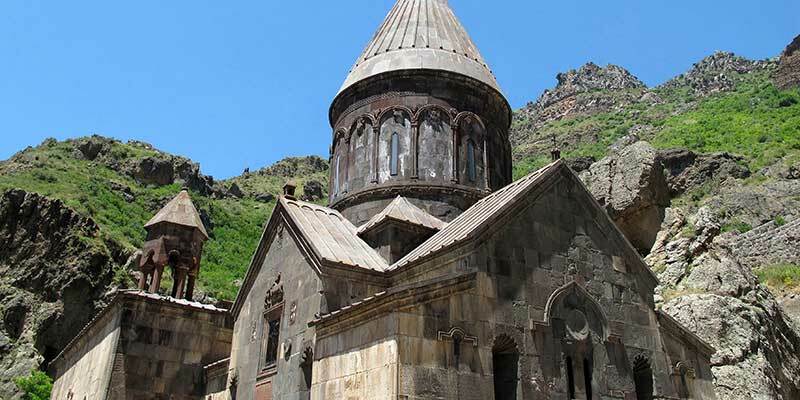 Extant chronicles report that Geghard monastery, besides of cave cells there were also several churches, living accommodations and various outbuildings. The monastery was glorified as a school for creating manuscripts, music academy and a place of pilgrimage. During the reign of the Bagratuni Dynasty Ayrivank survived the tragic period; the Arab forces leaded by commander Nasr in the second half of the 920-ies raided the monastery and destroyed it. Afterwards, the monastery was restored and protected by defensive walls that have survived to our days, but many manuscripts of the monastery have been lost forever. 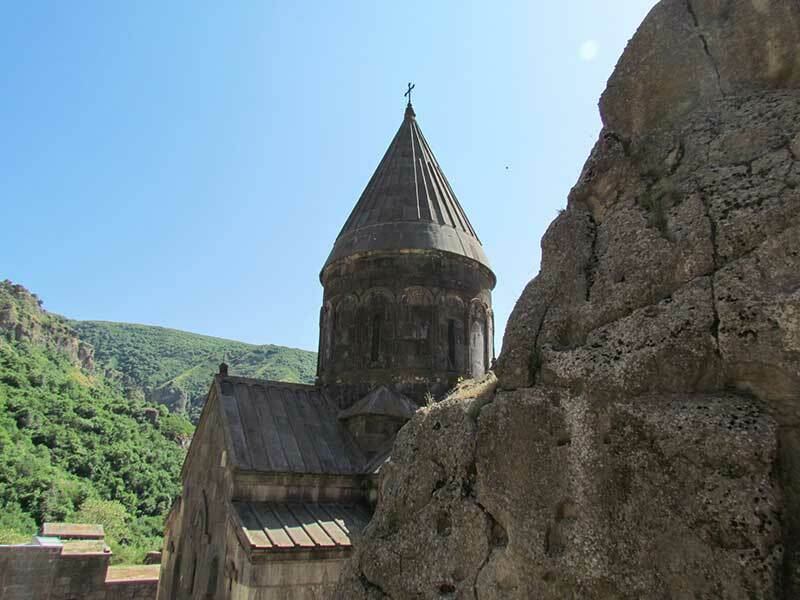 Although discovered inscriptions were made in 1160g., in fact Ayrivank main monastery complex refers to the 12th century. Renaissance of the monastery began only after Zakarians released Armenia from seljuks. At the end of the 13th century monastery was proud of its development, not only thanks to the patronage of the royal family, but also as a major place of pilgrimage, as it kept the Holy Lance, which, according to New Testament, the Roman legionary stabbed crucified Christ. Later, this monastery was called Gegardavank (“Monastery of the Spear”). Another relic kept there was a fragment of a wood from Noah’s ark. The monastery was raided by the Mongols, and later by Timurids. It was partially damaged by earthquakes in 1127, 1679 and 1840s, and later was rebuilt and served as the summer residence of Armenian Catholicos (the highest rank of the Armenian Apostolic Church). Some of the oldest buildings in the territory of the complex include a small cave chapel of St. Astvatsatsin (about 1164), Porch and Katoghike (Cathedral Church) relating to the period of Zakarian’s reign. The ruler Ivan Zakarian received the monastery along with many northern lands of Armenia as a sign of gratitude for the liberation of the country by Armenian-Georgian forces, and then sold Gegardavank to one of his vassals, Prince Hakbakyanu from Proshyan family who expanded the monastery and built a rock churches. The monastery gained popularity due to relics kept there, including relics of Apostles Andrew and John, donated to the monastery in the 12th century, and, as recorded, the “Holy Spear ” in 1250’s. 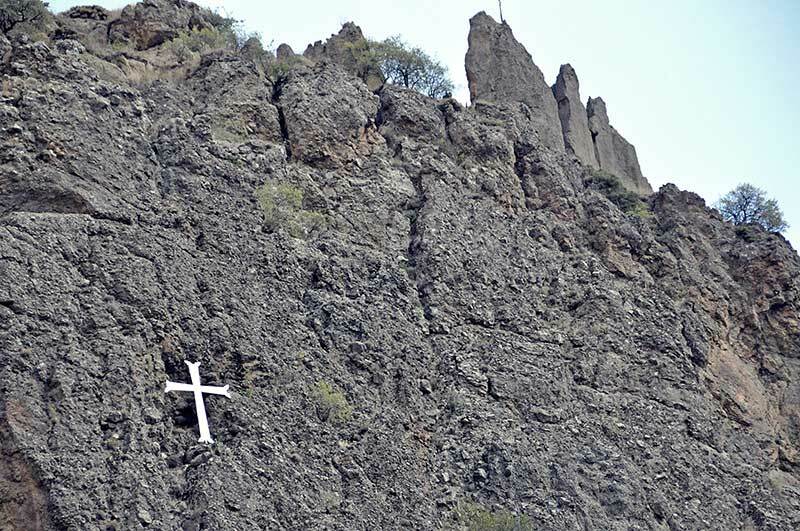 Numerous pilgrims worshiped relics transmitted to the Middle Ages in Ayrivank. The spear is kept in the treasury of Holy Echmiadzin. Samples of the Holy Spear and keptin Vienna, Krakow and Rome and known as the “Holy Spear”. 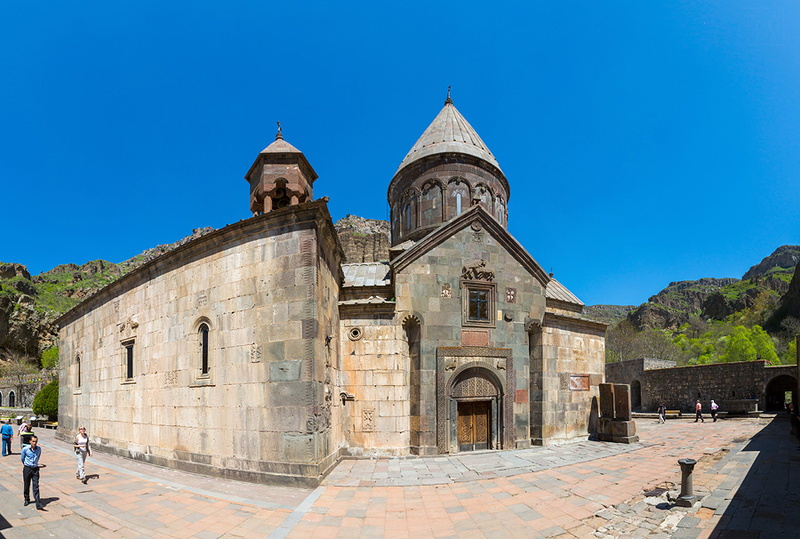 Visiting Geghard, tourists should pay attention to Katoghike church, the main building of Geghard complex, that was built in 1215. The fact is evidenced by the inscription above the west door. The church was built right in front of impregnable mountains. The south side of the church is facade with entrance. The flat surface of the wall is cut into two triangular vaulted niches in the form of half-cone. The entrance with rectangular niche and door frame is right between them. There is a large stone slab above the door decorated with branches and leaves of pomegranate and grape. The layout of the church is a cross inscribed in a square and covered with a dome on a square base. One of the most interesting works of Armenian architecture to pay attention to are the arches, that are built on the west side of the church. Monumental form porches in religious architecture repeat Armenian house glhatun, ie houses with tents in the ceiling. Here were held meetings; moreover, those were the places for princely families’ tombs. 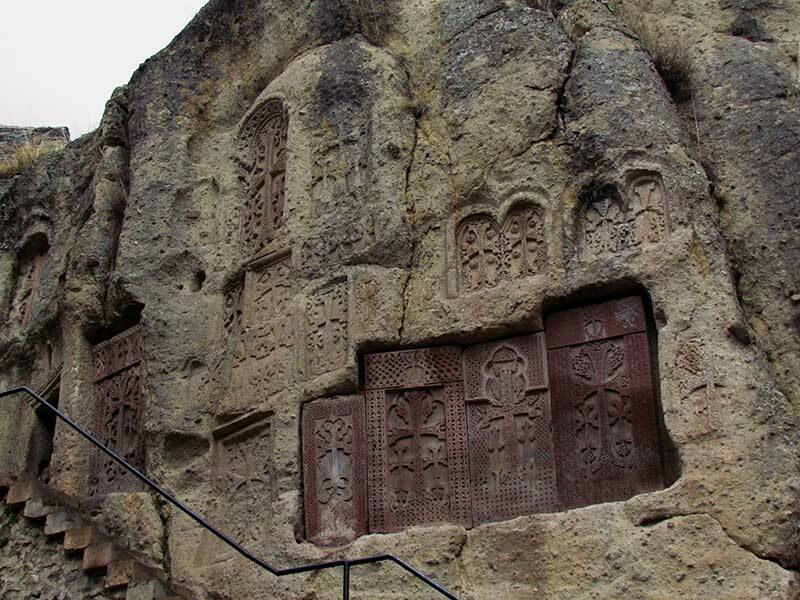 Zhamatun (1215-1225), a large porch on the west side of Katoghike church is connected on its north side with a rough rock wall with natural springs, worshiped as a sacred place since the Bronze Age. The outer walls of the monastery are decorated with numerous crosses and inscriptions. Khachkar (cross-stone) that stands to the right of the entrance between the porch and Katoghike is one of the most famous monuments of Armenian culture ( the work of Timothy and Mkhitar masters that is dated back to 1213). Going to the north-west (to the left Katoghike porch’s north wall ), you will enter the rock church Avazan (“Pool”). The spring that makes its way through the rock on the site of a prehistoric cave shrine is considered sacred to this day. This is where services were organized in the Hellenistic period, and probably it was one of the first worships of the water in the Bronze Age. The church was built in the mid 13th century (1230-1250 years) in the form of a cross-shaped construction with a dome and porches in the corners. The inscription on the basis of dome’s arch reports about Galdzak, the architect, who was employed to serve for Proshyans. He was responsible for the construction of tombs and the second church carved in the rock (on the opposite side of the complex). The first in-rock construction, porch-tombs are located in the north-east; they are decorated with carvings on the facade and niches to bury the remains of the nobility. Initially, its construction was entrusted to Zakarian in 1215, but the present building was provided for Prosh Hahbakyana who bought the monastery from Zakariana in 1283. He assigned Galdzak to expand vaulted hall with St. Astvatsatsin church. St. Astvatsatsin church with Avazan and upper mausoleum are one of the most famous achievements of medieval Armenian architecture. Complex inspires with its unique architecture; it is completely carved in the rock from top to bottom, the completion took more than 40 years. It is impossible to overestimate the degree of faith that inspired the architect and builders who completed such a tremendous job. The upper gate serves as a mausoleum; once it has been its original function. Here are preserved burials of princes Gregory and Meric from Proshyan family. Traces of the remaining graves have not been preserved. 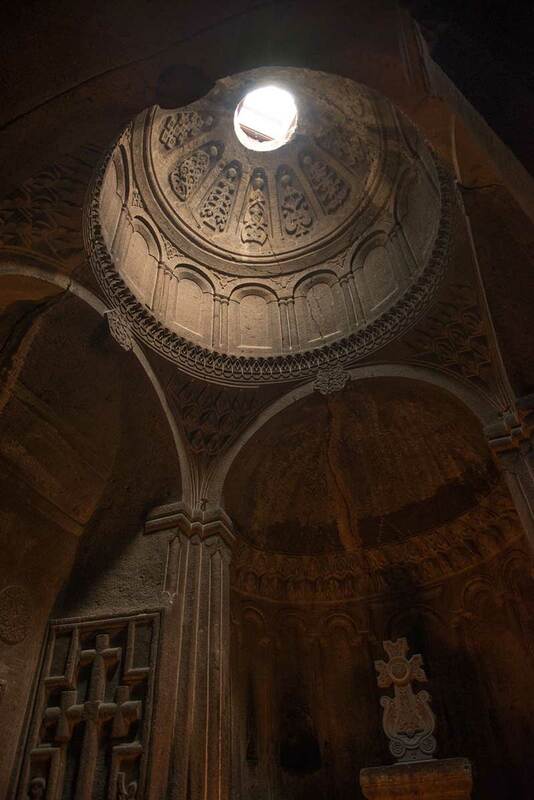 Room acoustics is amazing and perfect for performance of sharakans, Armenian religious chants, sounds which seem to ascend to heaven, and pour into the church. The monastery was also known for his music school and sharakans’ composers, among them was Saakaduht who created and studied music at a monastery in the 8th century. At the end of the porch, in the lower right corner there is a small hole, going to Proshyan’s tomb. It is believed that the hole was made in the Middle Ages so that the chants from the above could be heard from the lower floor. You can meet here singers of sacred chants. The monastery was also one of the writing centers. It wrote, rewrote, decorated with numerous miniatures of the manuscript. The monastery was also a rich library. In recent years only been landscaped home for the monks, the monastery courtyard, built a refectory. With its perfect architectural forms and rich artistic decoration Geghard and now is astounding visitors. When leaving the monastery visitors can buy some souvenirs from Geghard. Here you can find beautiful images of Geghard Monastery pictured on wood and clay both as like a magnet and a souvenir. You can also buy Armenian cross pendants and pomegranate pendants with chain. 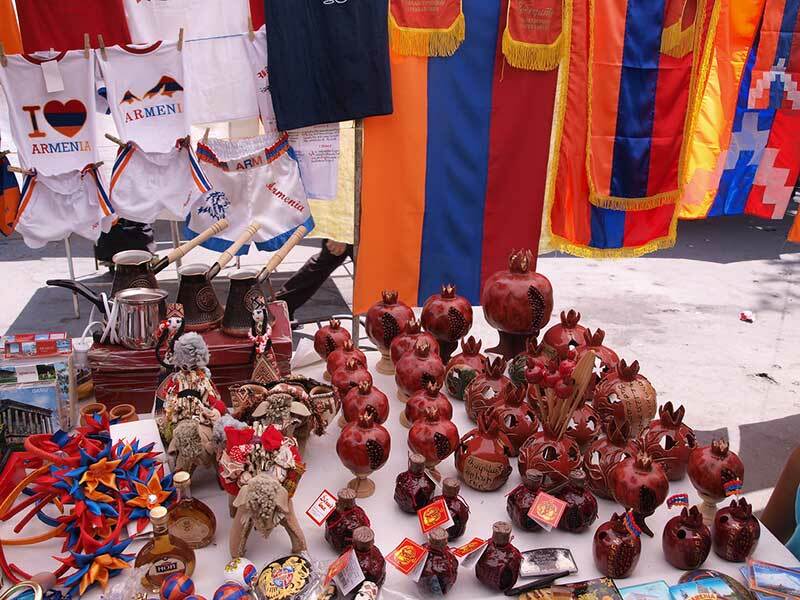 You can also find trinkets with the Armenian flag for the car and the keys. Geghard Monastery is also known for its “gata” with “khoriz”, that is baked by a special recipe and has an incredible flavor. Dear tourists, before leaving do not forget to try Armenian “gata” of huge sizes. 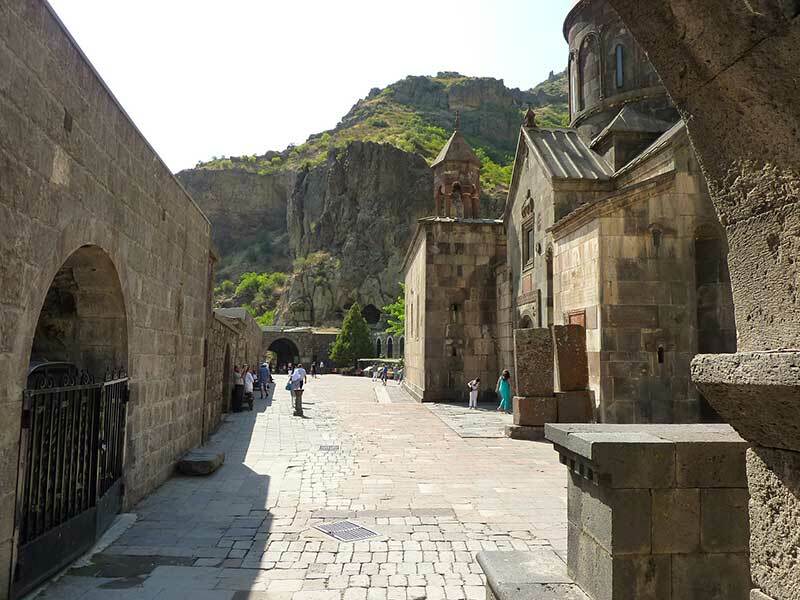 Geghard gata can be distinguished by design: on each of them there are names of the monastery, the Armenian cities, common names of Armenians. Here you can also try out the Armenian national cuisine: Armenian dried fruit. The most popular fruits are “Alani”, dried peaches stuffed with walnut, Fruit lavash or “tuthu lavash” (sour lavash) of plum, dogwood or cherry; sweet sudjukh with walnuts. 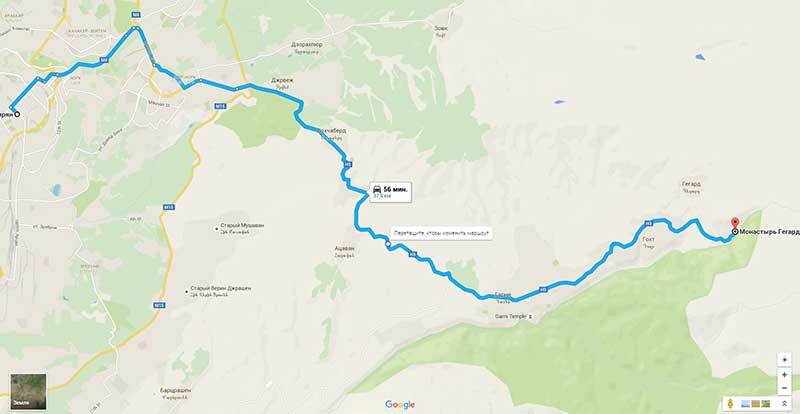 From the city center to Gegard is 38 km, it will take about 50 minutes to get there at an average speed of 60 km/h. You can also rent a car in Yerevan and organizer an interesting tour to Geghard.